Sorbus cashmiriana has corymbs of pinkish white flowers appearing in spring to early summer that are popular with the bees. They are followed by pearl like white berries that are up to an inch in diameter. Adorning the tree like bunches of snowy white marbles, they remain mostly untouched by birds and hang on to branches for longer than many of the other Rowan trees. Dark green pinnate foliage is made up of pretty, oblong leaflets. The foliage turns subtle shades of russet, orange and yellow in winter, but it is the large white berries that are the real star of the show in autumn and winter. This stunning small tree has an elegant spreading habit and will grow to 4 x 3 metres in 20 years. A wonderful choice for a smaller space, Kashmir Rowan will grow in most soils but does prefer slight acid where possible. It is a tough variety of Rowan that will tolerate pollution and exposed sites. Our pot grown Kashmir Rowan trees can be planted at any time of the year. Start by removing weeds and grass within a metre of your desired planting hole. Dig a square hole as deep as your root mass and approximately 2x as wide. To help the tree establish more effectively, sprinkle root grow in the hole. We recommend planting Kashmir Rowan trees (except clump forms) with a stake and tie kit. For single stakes, place the stake at an angle to avoid penetrating the rootmass and knock it in until it is firm. Use a buckle tie, placing the spacer between the stake and tree. 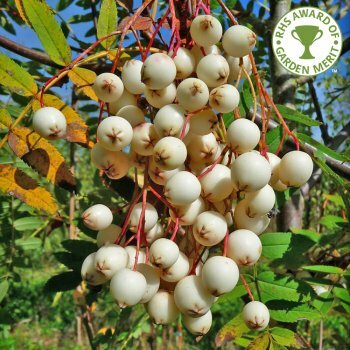 Kashmir Rowan trees require a strong framework to support their pearl white berries, so it is good to encourage this by raising the crown in summer. Simply prune the lower branches and any crossing, damaged or diseased branches within the crown. Hard pruning of Kashmir Rowan trees can be carried out in the dormant season, from autumn to winter.